SEO is still largely an unfamiliar topic for business owners and traditional marketers. While very few people will dispute the value of SEO, it’s safe to say the majority of business professionals don’t really know what SEO is, what it can and cannot do, and how to incorporate these strategies into an existing marketing framework. 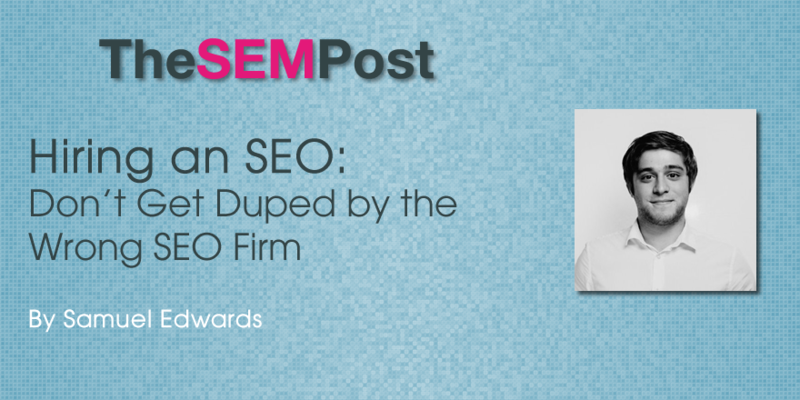 What’s most dangerous about this equation is that these same people – the ones that don’t really understand SEO – are spending lots of money on seemingly professional services. While there’s nothing wrong with hiring someone to handle an aspect of your business that you don’t understand, you really shouldn’t bring in an outside resource unless you know how to measure and analyze the work they’re performing. This is especially true when it comes to the SEO industry where – despite there being plenty of honest and well-intended experts – there are also plenty of scammers looking to make an extra dollar. The best way to tell an honest SEO from a dishonest one is by carefully listening to their claims and promises. When a company is trying to court you, they’ll often make promises they can’t realistically expect to keep. By spotting these claims, you can weed out the bad and hone in on the good. Here are some statements and promises that should turn you away. “I’ll get you a number one ranking.” This is the number one claim you’ll hear, but take it with a grain of salt. While a skilled SEO will eventually be able to push you to the top of the rankings, this is not something that can be promised. An honest SEO will tell you about the successes of some of their clients, but will be wary of making any guarantees. “We did XYZ in [insert any year prior to 2013].” The SEO industry changes so frequently that experience is extremely time-sensitive. If a company references something it’s done in the past, it needs to be something they accomplished in the last 24 months. A company that claims, “We got XYZ company a number one page ranking on Google in 2003” is basically telling you that it understood how to do SEO 12 years ago. What about in 2015? Do they understand SEO strategies as they pertain to today’s SEO landscape? Let them do the talking. You can learn a lot from listening to an SEO talk. If they’re dishonest, they’ll tip their hand sooner or later. On the other hand, if they’re honest, their experience will come out in the way they talk. Ask questions and carefully listen to how they word their responses. They should also ask you questions about your immediate and long-term goals. After hearing your expectations, they should be able to give you an idea of the basic strategies they’ll implement. Ask for case studies and referrals. The best way to ensure an SEO is being honest is to ask for past case studies, customer referrals, and a list of clients they’re currently working with. This will give you an idea of what people think about them and how effective they are at following through with claims. Knowledge of all three SEO tiers. In the industry, they say there are three different tiers of SEO knowledge. There’s the technical aspect (structure of the site), on-page optimization (keywords, HTML tags, etc. ), and off-page optimization (link building and traffic generation). An SEO should have experience with all three tiers. Regardless of how good you feel about your SEO, you need to stay on top of their performance. While your SEO should send you regular weekly or monthly reports, you can also track important metrics by frequently monitoring your Google Analytics account. If you see any discrepancies between your research and their reports, sort through them sooner rather than later. Ultimately, there are thousands of honest and experienced SEOs in the industry. However, there are also a handful of bad eggs. It’s up to you to differentiate between the two and find a solution that works for your company. Use the information contained within this article to be an educated searcher. It should also be added to be weary of contract terms. Why should a legit SEO agency lock clients to specific length contracts? If a clent is (and should be) properly educated of the process, then they should know it will take time. Build trust first, then links.